We proudly serve Louisville, Elizabethtown, Radcliff, Bardstown, Leitchfield, Vine Grove and all surrounding areas. For a limited time GET 10% OFF! when you schedule online for your free In-Home Consultation. Professional bath remodeling in Louisville for new showers, tubs and more. We provide affordable Louisville bathroom remodeling solutions and a detailed quote for your consideration in the comfort of your home. Serving: Louisville and all surrounding areas. You can trust us with your bathroom renovation project. We offer the best in renovation services. We guarantee we will use only the best quality materials and fixtures in your bathroom. So, if you want to get your bathroom looking like a five star spa resort, just follow these three easy steps. Make the bathroom of your dreams a reality! Step One: Either fill-out the order form on this website, or call us at (502) 200-1132. You can talk to one of our helpful schedulers right away. Our experienced estimator will come to your home and do an estimate, completely free of cost! Step Two: If you like our free estimate offer, our friendly expert estimator will visit your home and take a look at your bathroom. You can state your budget and go over your own ideas for the renovation. They will then compliment your ideas with their own expertise. The estimator will inform you about the countless options available. After taking the necessary measurements, they will draw up a plan to cater to your taste and budget. This will give you a reasonable idea of what to expect and how much the bathroom renovation will cost. It will also save you any surprises in the future. Step Three: Once you are satisfied with the estimate, we will schedule the renovation. Our on-site team will arrive with all the required tools and materials. They will complete the job without getting in your way. Our process is a far cry from traditional renovations with all its disorder and disarray. We make the whole process as simple as possible for our customers. Some renovations take as little as a day to complete. Five Star Bath Solutions of Louisville provides unmatched and affordable bathroom renovation services to our customers. We can take care of all your bathroom renovation needs. It doesn’t matter how big your renovation project is. Our professional contractors will make your dream bathroom come true. Contact us online today and schedule your free estimate! Take advantage of our free, in-home consultations and estimates today. Call us at (502) 200-1132! Having any room in your home renovated can be stressful. A bathroom can be especially stressful. Let our expert team transform your bathroom and take the worry out of the renovation process. You bathroom will look amazing and brand new in no time. Five Star Bath Solutions of Louisville will take care of everything for you. Just tell us what you want done, and we will make it happen! With more than 18 years of experience, we are the experts in the field of bathroom renovations. Staying true to our goals, you can count on Five Star Bath Solutions of Louisville to bring your bathroom ideas to life. At Five Star Bath Solutions of Louisville, we know the importance of both great craftsmanship and customer service. We know that communication is the key to good relationships with our clients. There is no cutting corners with Five Star Bath Solutions of Louisville. We believe in completing each job perfectly. Our goal is to ensure 100 percent satisfaction of all our customers. Pick up your phone and call today for a free onsite estimate. Find out for yourself what makes Five Star Bath Solutions of Louisville the best choice for bathroom renovation! Call Five Star Bath Solutions of Louisville to set up an appointment. An expert estimator will come to your location with the tools and skills to give an accurate estimate. Our estimator has the required skills and knowledge to give you the best information. After that they will let you make the decisions for your bathroom remodel. Our estimator will start by asking about your ideas for the renovation. Once we know the scope of the project, you can count on us to not only meet your expectations, but strive to exceed them. Ensuring your total satisfaction is our goal. We provide the best service and an array of over 9000 options to choose from. You can choose the design that best fits your style and needs. We don't let just anyone walk into our homes, you shouldn't have to either. That is why at Five Star Bath Solutions of Louisville, we follow rigorous procedures for our customer’s safety. Each our craftsmen undergo thorough screenings and background checks. In addition, they have proper licenses to provide the services they offer. You can have complete peace of mind that the team working in your home is completely professional. As one of the most reputable companies in the area, we work to earn the complete trust of our customers. We know that if the work is not done properly, even the best quality products can fail. But you can count on our skilled technicians to complete every job right and according to factory standards. Contact us online and schedule a free appointment with no obligations. Take advantage of our free, free, in-home consultations and estimates today. Call us at (502) 200-1132! No matter what kind of renovation job you need to be done, count on Five Star Bath Solutions of Louisville to provide the best service possible. We can handle any bathroom, no matter how big or small. Make your bathroom remodeling project easier by choosing Five Star Bath Solutions of Louisville. We have the products and services to make it happen. Choose a to install walk-in bathtub, a new tub surround, or do a complete bathroom remodel. We cater to your needs and budget. Are you looking for specialists in the field of bathroom renovations? We have years of hands-on experience working with the best quality products in the market. Our excellent customer service makes us one of the most trusted companies in America. We put your needs and wishes before everything else. Our customers regularly refer us to their friends and family. If you too want to experience our unmatched service, give us a call today. Your bathroom should be the one place in your home where you can be at peace. You want to be away from all the chaos of the outside world as you soak in a hot bath, letting all your tiredness and worries melt away. Why spend thousands of dollars at some spa when you can have all those benefits in your own home? Our friendly staff will be more than happy to schedule a free appointment for you at your convenience. Contact us online today to schedule an appointment! 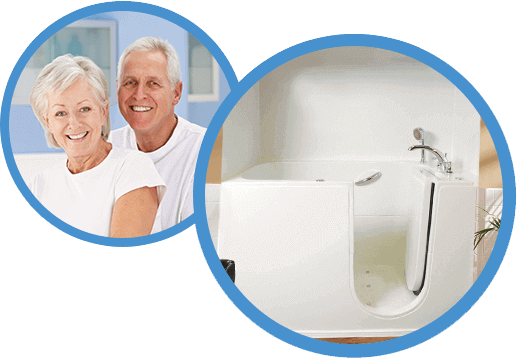 If you are looking for an affordable way to restore your bathing independence, we have the solution. TubcuT® is the magical spell to use! A specially designed tub-to-shower conversion through certified, professional TubcuT® installers. This certification has enabled us at Five Star Bath Solutions to create a step-through opening in your present bathtub. Now your bathtubs can be altered or modified to create a low barrier entry into your tub area. We can customize tubs made from fiberglass, cast iron, steel or acrylic. This modern duo using TubcuT® gives a flawless look while ensuring easy accessibility and entrance. Our certified TubcuT® installers will complete the installation in a very short amount of time. You will be able to use your converted walk-in bathing area as early as the next day! For more details and insights on our products, contact us at (502) 200-1132 to get in touch with our representatives in Louisville. Walk-in bathtubs provide freedom in bathrooms that address those with limited mobility. Our walk-in bathtub allows easier access to the tub and eliminates the chance of slipping while showering. Our walk-in bathtub installation services provide the perfect solution for your peace of mind. Call Five Star Bath Solutions of Louisville today to schedule a free appointment. Our expert renovator will help you choose the best walk-in bathtub to suit your needs, bathroom, and budget. Let Five Star Bath Solutions of Louisville help you bathe safely and independently again. Thanks to our two-piece patented design, our special walk-in bathtubs can go through any doorway and into any bathroom. It fits right into the foundation of your existing bathtub, beautifully blending with the rest of your bathroom. A new tub surround is just what your bathroom needs. We offer top quality bath and shower surround areas that are solid, beautiful, and affordable. Five Star Bath Solutions solid wall systems are completely customizable to fit the shape of your tub or shower area. These tub surrounds are guaranteed to lasts as long as the life of the bathroom. A tiled wall has to be replaced every 10 to 15 years because the grout becomes discolored and begins to crack allowing water to get behind the walls. We have a variety to solid bath walls colors and patterns to choose from. Don’t fall for the box store deals offering low quality, pre-manufactured tub enclosures. Get the look you want with a fully customizable acrylic bath or shower surround. We offer a selection of stone like patterns, and tile like textures for you to choose from. They have all the beauty of real stone without the weekly and daily maintenance requirements and it looks just as good. These solid bath wall enclosures for tubs and shower are sealed using quad lock technology to keep the water headed in the right direction. Many tub and shower areas are not exactly square. With our fully customizable tub and shower surround surfaces, we will design a tub surround that fits the unique footprint of your tub. Our products are made to last and come with a guarantee. Our solid bath wall technology is UV and scratch resistant, which means it will continue to look good though the life of your home. These surfaces are easy to clean and resist mold and mildew growth. A new shower or tub surround will improve the look of your bathroom and add to the value of your home. Our trained and professional installers can renovate your bath or shower in as little as a day. Have a qualified Five Star Bath Solutions professional install your new tub or shower enclosure today. We are the most reputable bathroom renovation service in Louisville. Over the years, we have served thousands of customers and left them 100 percent satisfied with our renovations. We have a network of bathroom remodelers serving in your local area. We guarantee our team offers the best renovation service you will ever find. If you want a new tub enclosure, shower surround, or walk-in tub, Five Star Bath Solutions of Louisville can install it. We offer the biggest catalog of bathroom accessories to suit your style and fit your budget. Give us a call and find out for yourself what makes Five Star Bath Solutions of Central Kentucky the best choice for bathroom renovations! Boasting 30th rank in the list of most populous American cities, Louisville Kentucky is the hub of historic preservations in the US. Louisville witnessed its first modern European settlement in 1778. The armed forces of King Louis XVI of France allied with the American forces in the Revolutionary Wars. The city adopted its name in the honor of the King. The Great Flood of 1937 destructed and submerged more than half of the city. The city, which had always been the cornerstone of national armed activities, survived various other national calamities including the F4 Tornado. Today, the city boasts its contributions with Kentucky Fried Chicken, Kentucky Derby, Louisville Cardinals, and athletic teams of the University of Louisville. Located in a humid, subtropical region, Louisville welcomes four seasons along the year, apart from extreme weathers including tornadoes and floods. From May to late September, the city observes mild to severe summer. Fall season starts from September, including heavy precipitation. Snowfall is occasional but the temperature may fall below 15F. The land is rich in grass and water, including the Falls of the Ohio on the north-central side and Ohio River on northeastern side. Louisville shares a border with Indiana. It has a mixed culture. The city has witnessed serious political activities since birth. Louisville is included among median-income cities with a majority of population comprised of white Roman Catholics. At the immediate south, the downtown business district is located. Primary business activity takes place in the suburbs, towards Hurstbourne Parkway. A major part of the city on the southeastern and immediate southern location is comprised of residential buildings and entertainment centers, including the 22,000-seater KFC’s Yum Center. Louisville exhibits America’s rich history. Each building tells a story of American development. If you are interested in learning more about fascinating facts and important milestones in Louisville Kentucky, please visit their official site below. Serving: We serve Louisville, Elizabethtown, Radcliff, Bardstown, Leitchfield, and Vine Grove and all surrounding areas.